The question is always raised, why is there no single organization that represents LPFM in a similar way that the ARRL represents amateur radio and the NRA represents the rights of firearm owners and manufacturers. This is mainly because no group, not even REC, Prometheus Radio Project or Common Frequency as well as national organizations like the NRB or the Catholic Radio Association can fully represent all sectors of the LPFM service. To understand what I mean, let's look at each of the six segments of Low Power FM radio stations. Within each segment, some segments even have sub-segments. 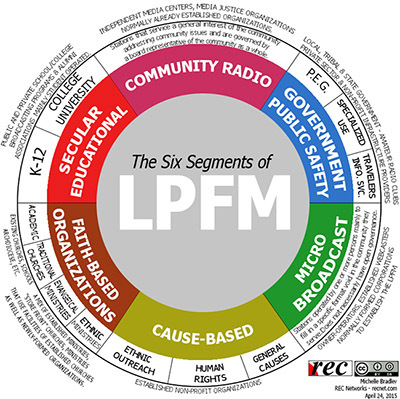 All in all, the diversity of organization types that use the LPFM service is vast. This is the segment that many of us associate with LPFM. These stations are normally ran by community groups that were either formed from media justice organizations or other similar movements. This segment represents those who, in the 1990s following the passage of the Telecommunications Act took on the cause to protest the expanding concentration of media, especially on radio. Community media stations are normally governed by members of the community at large that may serve terms on the board of directors. There is usually also an advisory board of members of the public at large that help steer the station where it comes to programming. These stations are dependent on volunteers to work at the stations. Community radio stations are likely to broadcast a large amount of local speech-based programming with a share of national programming such as "Democracy Now!" as well as other specialized programming from sources like Pacifica's AudioPort. These stations are normally funded by listener donations and are more likely to get corporate underwriting. While some Community Media stations may be licensed to organizations that may be cause based, the overall operation of the station is not directly tied to the cause but represents the needs of the community as a whole. An example of such a station is WRFU-LP in Urbana, IL. While the station is licensed to an organization called Socialist Forum, which may seem like a cause-based organization, the station is operated out of the local independent media center and has a structure that allows for full community involvement on a wide variety of issues. Community Media stations may include those newly formed corporations that were started for the sole purpose of running a station. In this case, Community Media is distinguished from the Micro Broadcast category if the organization has a transparent form of governance including an rotating board of directors and/or advisory board and that volunteers are sought from throughout the community. LPFM stations segmented by REC as Micro Broadcast that feel that they meet the requirements of Community Media should contact REC to have their segment reviewed. P.E.G. (Public Access, Education and Government) - In the cable TV industry, PEG refers to a segment of channels set aside on a channel lineup to for public access TV, educational access from local schools and universities and access by the local government that is the franchising authority for the cable system. For many years now, city governments have been operating "government access" channels (the "G" in "P.E.G.") on cable television. These channels are operated by or at least overseen by the city. These channels would carry public affairs programming, council and board meetings, community calendars, traffic information, emergency information and other related programming. Some LPFM stations licensed to city governments are set to be operated by the same telecommunications department that operates the government access channel as is the case in Boston. Unlike the AM traveler's information service, the FCC has given no specific guideline on what is considered public safety programming except to state that a "majority" of programming should be public safety related. Travelers Information Service - When LPFM was established in 1999, one of the major supporters was the New York State Thruway Authority. They envisioned that LPFM stations could be used to supplement and in some cases, replace travelers information stations operating on AM. While content is restricted on AM (which is licensed through Part 90 of the rules), TIS content on LPFM is not restricted. During times when there is no current emergency, some TIS stations (such as those operated by the State of Colorado) will carry NOAA weather radio. Specialized Use - While some grantees in this segment have not fully implemented their stations, we can see some potential diverse use of these stations to meet a public service/public safety purpose, especially by those LPFM stations that have been granted to amateur radio clubs and rural electric cooperatives. One unique use of a public sector-owned LPFM station was the former KAQU-LP in Sitka, Alaska which used their station to broadcast whale sounds from an underwater microphone. The micro broadcast sector is another very vocal group in LPFM. Many of these stations in this segment were as a result of individuals or a small group of individuals who want to start their own radio station. Stations in this segment are most likely to have a music format and in many cases, a format that is not normally heard on commercial or even non-commercial radio. Like Community Radio, Micro Broadcast stations may carry some community and public affairs programming but unlike Community Radio stations, they are not necessarily under the advisement of a steering committee or have rotating board members. Micro Broadcast stations were most likely started by a sole individual that funded the entire station start-up and may have more difficulty obtaining corporate underwriters than a station in the Community Radio sector. Those who run stations in this segment are likely to have a deep devotion to the music genre(s) they feature and operating the station is a serious passion for them. LPFM stations that are operated by existing non-profit organizations to extend their educational message to the general public through the use of radio. Within this segment, there are sub-segments for Human Rights organizations that work towards specific causes such as immigrant farmworkers' rights, LGBT rights, ethic equality, etc. Ethnic Outreach stations are those that were established to specifically reach out to an ethic group, normally in their native language. For these minority groups, these stations are not just a lifeline with their culture but is a resource for living in our country. Those stations that may have a specific cause that is not related to human rights or outreach to ethnic groups would fall under our General Causes sub-segment. Ethinic Ministries - This is a natural transition in the segment circle from the Cause-based Ethnic Outreach stations. Stations in sub-segment operate in native languages and broadcast bible-study and evangelism and may include music. These stations can also serve as community lifelines for ethnic residents of the local community by providing information on secular services and emergency information. Evangelical Ministries - This sub-segment is represented by a large number of evangelists, pastors and others who may have small congregations that may meet inside homes, store front locations or in space borrowed from another church. Some of these organizations may have, in the past, purchased time on other radio stations. These ministries depend on radio and other electronic media to get their message across. Traditional Churches - These are stations that are operated by the "brick and mortar" established churches such as the Catholic and Seventh Day Adventist churches. The organizations associated with the Calvary Chapel movement would fall into this sub-segment. While these churches may air some local programming such as bible studies and church services, some of these stations may carry national programming from sources such as the Catholic EWTN, the SDA's 3 Angels Broadcasting Network as well as the Calvary Satellite Network. Some stations in this category are actually operated by larger organizations but are licensed to the individual churches. In most of those cases, they carry national programming full-time. Academic - Stations that are licensed to faith-based academic institutions, K-12 and colleges are represented in this sub-segment. Most stations are not managed by students but instead by the staff to convey the doctrine of the institution. Stations operating in this segment are licensed either to an educational institution, an alumni association, a foundation or the student union. Stations in this segment are associated with as school, either a K-12 or a college/university. In most cases, the operation of the station is a part of a broadcasting or journalism program at the institution and is overseen by staff even though students may actually manage the day to day functions of the station. Prior to LPFM, many of these stations were only webcasting while some others may have (and may still be) carried ont he local cable television system or over an AM campus radio system by antenna or carrier current. Stations that are not controlled by the university but are operated students of the university may also appear in this segment (this includes students of faith-based schools where the school as no control in the program content). Depending on the station, they may be funded through taxpayer funds to support the school, booster clubs, underwriting and in some cases, on-air fundraising. Hopefully, this presentation into the Six Segments of LPFM demonstrates the types of stations that use LPFM licenses and also gives you an insight on how REC advocates for the LPFM service to assure that the needs of all Six Segments are taken into consideration. REC is in the process of assigning segments to all LPFM stations. The segment assignments can be found on the REC LPFM Scoreboard.